Sorry I haven't been here earlier today. Not much is going on, except perhaps a shift in the weather, and I've been feeling kind of out of it today. Anyway. We have poached eggs for lunch quite often (once or twice a week). 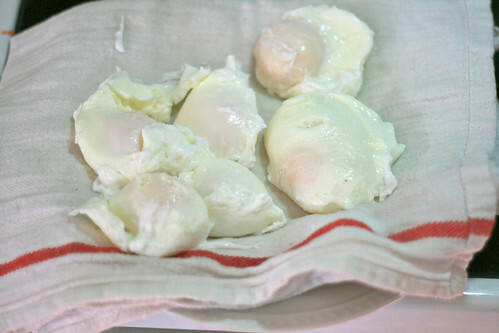 I think if you really learn to poach an egg well, it can take you far in life. People seem impressed by this skill. And they are really good. Now, normally we eat poached eggs with toast, butter, and some cheese. 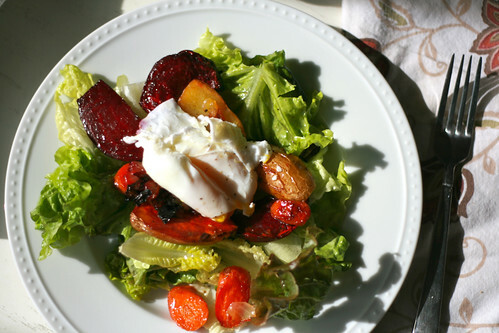 But last week, I was thinking a poached egg on salad sounded delicious and lo and behold, the very next day, the November issue of Everyday Food arrived with a recipe for salad with roasted vegetables and poached eggs on top. 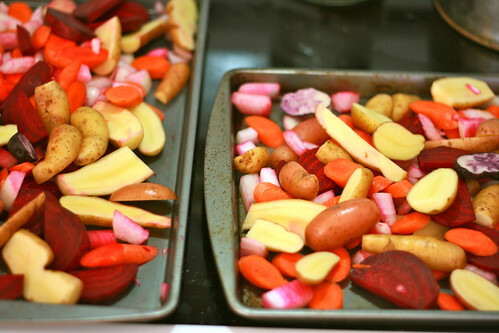 Since my kids don't turn down roasted vegetables (especially beets, carrots, and the crispy, caramelized bits of onions! 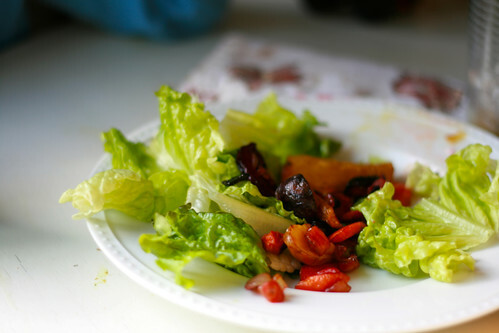 ), and since James would eat nothing but salad at every meal if he had the opportunity, I thought this would be a hit. It was so good! If you don't have a copy of the magazine, you'll have to pick one up or wait a month or two for them to put the link up on the website. 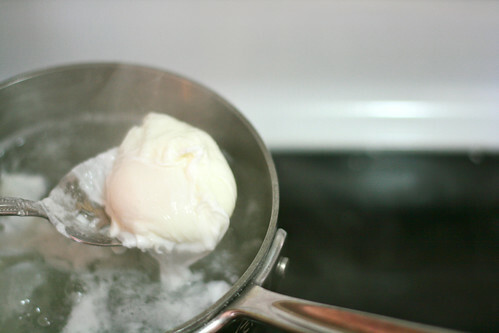 Here is my method for poaching eggs. It's pretty much fool-proof. Bring a tall saucepan of salted water to a rolling boil. Break one or two eggs into a small bowl and carefully lower them to just above the surface of the water, and then quickly slip them in. Set a timer for four minutes. 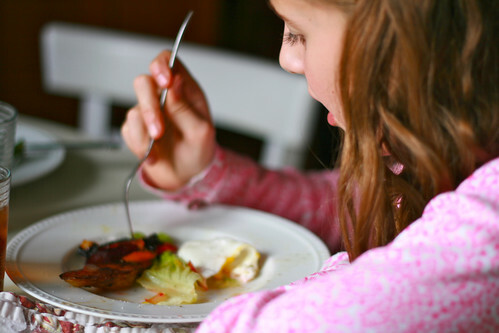 (This is not forgiving, like the spaetzle -- you'll want to stay right there!) I usually make 4-5 eggs in the same pot at the same time. Skim the water occasionally if it seems likely to boil over. 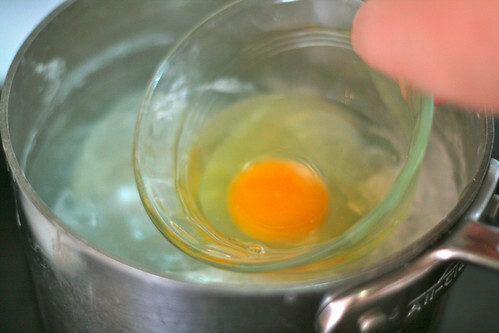 Use a slotted spoon to carefully lift the eggs, one at a time, from the water. You can place them in individual bowls with a small pat of butter and serve immediately with toast, or you can place them on a towel-lined plate to drain slightly first. The whites should be completely set but the yokes should be very runny. If four minutes leaves them overcooked (depending on your stove, your altitude, and a number of other factors), try 3 1/2 minutes the next time. If that still yields an overcooked egg, you could try 3 minutes. But start with four the first time just to be safe. They do require a bit of care, but they are so worth it! And I highly recommend them on salad! In addition to my lunch post, I'm joining Ginny in the Yarn Along again today. I finished the body, neck, and button bands on James's sweater. Just the sleeves to go! This week the only thing I read was the Catechism of the Catholic Church. My husband and I are following a schedule to read the entire thing during the Year of Faith. And finally, Halloween is in one week! How is that possible?! I finished Elisabeth's costume on Saturday and about half of James's on Sunday. 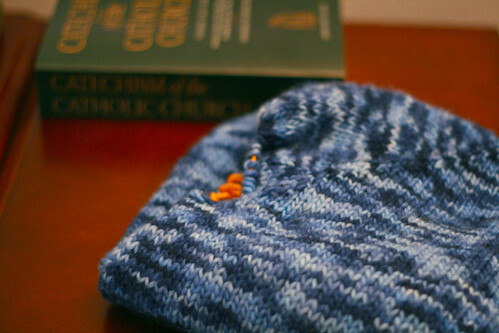 I could've completed more of it but my husband roped me into some projects around the house, which I'm glad we did. I haven't started anything for Fiona yet, but I may not. She is up in the air about what to be. There is a choice between an old costume of Elisabeth's or one I'd need to make. Right now I don't have the supplies on hand for the one I'd need to make and I'm not sure if I'll have the funds in time to buy them. We'll have to see.